Pennsylvania has a program that offers all new mothers a free radon test and information packet when they leave the hospital with their new baby. This gives every newborn baby a chance of growing up in a radon-free home. The plan was started in Pennsylvania over 20 years ago, has over 70 hospitals participating and has a success rate of over 40% (that is over 40% of those given the free test kits actually test their homes. Similar programs have been successfully adopted in other states: Alabama, Michigan, New York, North Carolina and Utah all have asked for information on Pennsylvania's program. The Utah Radon Program duplicated Pennsylvania's effort in 2005 and won a statewide public service award for its work. KRNV Channel 4 Reno newsbrief on Pennsylvania Governor Rendell's promotion of the program. "PA Governor Rendell Taking New Steps to Protect Pennsylvania Families from Radon:"
See below for text of the news story. This useful Newborn Radon Program presentation explains the costs and benefits of the program. This letter is sent as a followup to kit recipients who failed to return the kits. 84 hospitals are currently in the program. The Newborn booklet is 16 cents/piece and the return postage on the certificate is 45 cents each. 34 kits were returned invalid/blank. That's 96 households or 32% of those that returned the kits, who discovered that they had high radon in their house. Quite a worthwhile program in my mind. Fashioned after the successful Pennsylvania Newborn Radon Program (including logo and even color! ), the Lake Tahoe Newborn Radon Program could (if supported by the hospital and community) provide free radon test kit flyers for all parents of newborn babies at Barton Memorial Hospital in South Lake Tahoe. 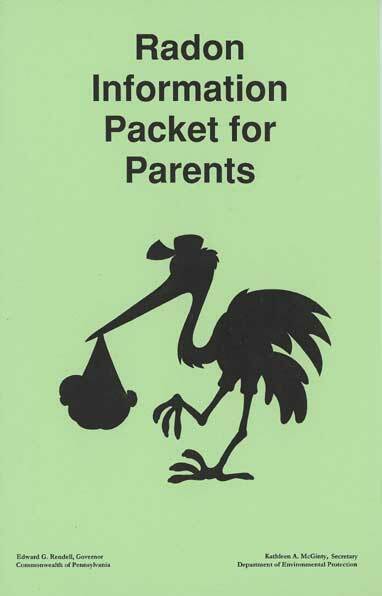 The green cover, stork image, graphs and text encourage new parents to provide a clean and healthy environment for their new child by first testing their home for radon. Free test kits will be provided through a health grant (so far undesignated). When operational, It is hoped that this first (to our knowledge) radon outreach to new parents in California will be taken over and reproduced by the California State Radon Program, similar to Pennsylvania's successful program. View and print our initial attempt at a Tahoe Newborn Radon Brochure. HARRISBURG, Pa., Jan. 5 /PRNewswire/ -- Pennsylvania Governor Edward G. Rendell said today Pennsylvania is taking steps to help more families protect themselves and their children from a leading cause of lung cancer with the expansion of its Newborn Radon Program. The Governor said 19 new hospitals have agreed to join the 50 hospitals already participating in the program. "This program can give new parents peace of mind," Governor Rendell said. "The Newborn Radon Program not only teaches parents about radon, it gives them the opportunity to get a free radon testing kit." "We are getting vital information into the hands of parents so they can take action to protect their families against radon in their home," Environmental Protection Secretary Kathleen A. McGinty said at a news conference in the maternity center of Harrisburg Hospital, one of the 19 new participants. "Radon test kits typically cost about $25, but by giving new parents the opportunity to get free test kits, more Pennsylvanians will test their homes and take action to reduce radon levels, if needed, to keep their families safe." DEP's Radon Division has been working with hospitals throughout the state to implement the Newborn Radon Program for the past 12 years. Participating hospitals provide a radon booklet, which contains a certificate for a free radon test kit, as part of the information new parents receive before they leave the hospital. Of those families that have submitted the free test kit certificate, 39 percent have returned the kits to determine radon levels in their homes. "PinnacleHealth is pleased and proud to participate in Pennsylvania's Newborn Radon Program," said Cheryl Key, vice president of nursing professional development and practice at PinnacleHealth System, which owns Harrisburg Hospital. "By providing this important safety information to new parents, we foster an awareness of this issue and help educate adults to keep their families healthy and safe." DEP launched an outreach initiative last fall to get more hospitals involved in the program and enhance the state's national leadership on radon protection. Alabama, Michigan, New York, North Carolina and Utah all have asked for information on Pennsylvania's program. The Utah Radon Program duplicated Pennsylvania's effort last year and won a statewide public service award for its work. Radon is an odorless, colorless gas that occurs naturally from the breakdown of uranium. High levels of radon have been found in homes throughout Pennsylvania, and the only way to know the level in your home is to test. Testing is recommended to be done during colder months, when homes are closed and radon concentrations tend to be at their highest. The U.S. Environmental Protection Agency estimates approximately 22,000 Americans die each year from lung cancer caused by exposure to high levels of radon, second only to cigarette smoking-related lung cancer deaths. "The Newborn Radon Program has more people testing their homes for radon," McGinty said. "That means more people are taking action to reduce high radon levels, and that saves lives." Pennsylvania law requires anyone who tests or performs remediation work on a home other than the home in which they live must be certified by DEP. Residents who don't qualify for the Newborn Radon Program can buy test kits in stores. For more information on radon and a list of certified testers and remediators, visit http://www.depweb.state.pa.us, or call 1-800-23 RADON. The Rendell Administration is committed to creating a first-rate public education system, protecting our most vulnerable citizens and continuing economic investment to support our communities and businesses. To find out more about Governor Rendell's initiatives and to sign up for his weekly newsletter, visit his Web site at: http://www.governor.state.pa.us. EDITOR'S NOTE: Following is a list of the 69 hospitals participating in the Newborn Radon Program. The asterisk (*) indicates the 19 hospitals that joined the program this year. CONTACT: Kate Philips, Pennsylvania Office of the Governor, +1-717-783-1116, or Ron Ruman (DEP), +1-717-787-1323. Disclaimer: Information contained on this page is provided by companies featured through PR Newswire. PR Newswire, WorldNow and this Station cannot confirm the accuracy of this information and make no warranties or representations in connection therewith.